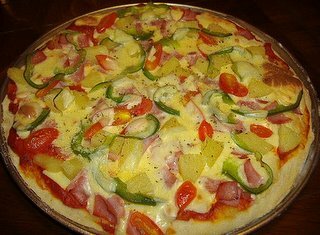 Kin Jay (Vegetarian Food): Vegan Pizza! This menu for vegetarian, it’s easy for cooking and delicious. Moreover, it isn’t cholesterols for food. That is good idea for vegan. Cut the loaf into some thick slices (as many as you want - I like to eat 2 or 3 at a time). Then spoon some sauce on top of each slice - not too much, not too little. Sprinkle the nutritional yeast flakes on top of that - not enough to smother the sauce, but enough to make an impression! Then sprinkle some garlic on that. pop the slices in the toaster and, when the edges start to brown, pull 'em out and wallah! Vegan pizza!